Schoolchildren in this picture book show their affection for pilots who fly over their school by sending them letters, drawings, and many violet flowers. Early elementary school students in Japan can learn about kamikaze attacks from this picture book if a teacher or parent provides some historical background. Although the book takes place during a time of war and human loss, the actions of the teacher, children, and pilots exemplify kindness. Sukeyuki Imanishi wrote numerous children's books, including several dealing with World War II. He served in the Japanese Navy during the war, and he went to Hiroshima soon after the dropping of the atomic bomb in order to aid victims. Although not a pilot, he served four months at Kagoshima Naval Air Base in southern Kyushu. He first flew to Okinawa in 1975, when he saw from the plane many beautiful small islands between mainland Japan and Okinawa. 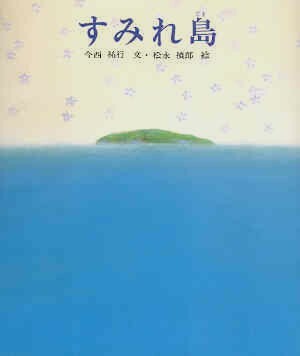 The story of Sumirejima (Violet Island) first appeared in 1982 in a magazine of children's literature. Imanishi received several literary awards during his writing career, and he passed away in 2004. The story takes place in the spring of 1945 in southern Kyushu, where kamikaze pilots from several air bases fly toward Okinawa in order to crash into American ships. The children at one elementary school on the coast frequently see planes fly over their school. They write letters and pick violet flowers to send to pilots at a nearby air base. The schoolchildren receive a letter of thanks from one pilot, who writes that he and his friends played sumo wrestling with the violets during the evening prior to their departure. After the war there exists one small uninhabited island full of violet flowers, so perhaps a kamikaze plane carrying flowers from the children crashed there after developing engine problems on the way to Okinawa. The author understands the interests and psychological development of his young readers. The pilots play a game with "sumo wrestler flowers," which children will have natural curiosity to understand. The pilots end up tearing off the blossoms, but they really have fun the night before their sortie. The kamikaze pilot's letter expresses appreciation for the children's thoughtfulness, but the pilot does not give any details about his military mission. The book does not provide details regarding history and geography but instead focuses on portraying positive human emotions and portraying tangible items such as flowers and planes to which children can relate. The illustrations show little detail, but one drawing does show some ships on fire and planes diving toward them to give children an idea of what happens in a kamikaze attack. Although the book is based on history, children on the coast of southern Kyushu would not have been attending elementary school and playing outside in the schoolyard during the Battle of Okinawa. American B-29 bombers and other warplanes regularly flew over this area in the spring of 1945, but this picture book makes no mention of enemy planes. It is an historical fact that the Navy and Army had several air bases in southern Kyushu, and kamikaze planes sortied one after another for about three months. Also, many Japanese kamikaze planes did develop engine problems on the way to Okinawa, so they made forced landings on or near small islands. Sumirejima (Violet Island) portrays a young, considerate kamikaze pilot who plays a game from his youth on the final night of his life. The book also depicts a woman teacher and her students providing encouragement for pilots at the nearby air base through their letters and gifts of flowers. Although death and war can be a sensitive subject for young children, this picture book thoughtfully introduces the topic of kamikaze attacks.